SafeIP is a free tool that will appeal to many computer users in these security-conscious times, when we are all trying to keep our computer activities away from malicious eyes. A key part of modern online privacy is keeping your IP address hidden, and this tool will allow you to do exactly that with a minimum of hassle. Ordinarily, every time you visit a webpage, your IP address will be logged. As this raises obvious security concerns, many people wish to opt out of having their IP logged. SafeIP recognises this, and will keep your IP address hidden from websites, along with games and other pieces of software. It does so by offering a range of anonymous IPs that are located nearby; you will be able to choose one from a list, a simple and straightforward way to help make sure that your Internet activity is kept as private as possible. What's more, as the list is organised by location, you will be able to pick out the anonymous IP that is closest to you, thereby speeding up your anonymous browsing. SafeIP is a completely free tool. It does not come with an expiration date, and will not hassle you with bothersome adverts. Instead, it aims to be as simple a way of keeping your IP address hidden as possible. Free Anonymous Surfing with WiFi Protection. Surf anonymously, hide your IP address, and unblock websites, all for free with SafeIP. Select your preferred proxy IP location and change your IP address at anytime. The automatic startup option will ensure your IP is protected at all times, even before your Internet connection starts. Our free Ad and Malware databases can protect your PC from infections in realtime and speed up your web browsing by blocking unwanted websites. Randomly change your MAC address for enhanced network protection. Prevent websites tracking you based on your Browser Fingerprint ID, using our proprietary anti-tracking algorithm. 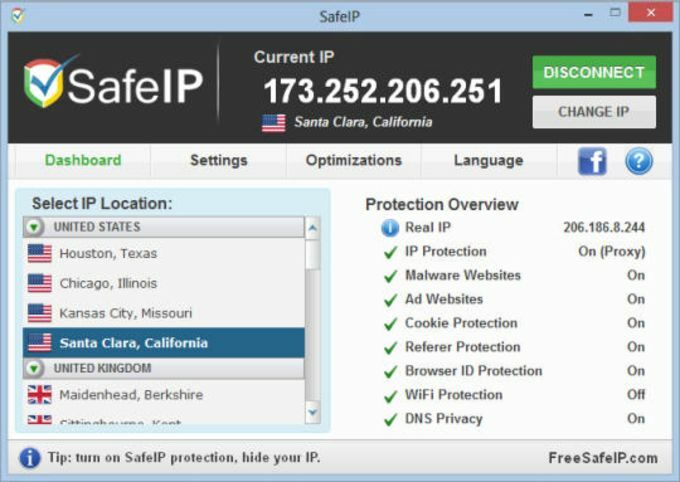 SafeIP is free to use without ads and never expires. Unlike other competitors, SafeIP users may upgrade for access to VPN accounts and choose to use proxy or VPN mode. Our new Speed Boost setting allows faster connections with secure VPN connections for Torrent protection and better compatibility with all Internet applications. Users are not limited in bandwidth nor have throttled speeds in any way. Users who want to secure their home or public WiFi Internet connection, or located in countries with heavy Internet censorship, or away from their home country trying to access their favorite sites while traveling will all benefit from using SafeIP. SafeIP is available in 26 languages, more than our competitors. Surf anonymously, hide your IP address, and unblock websites, all for free . Surf anonymously, hide your IP address, and unblock websites, all for free with SafeIP. Select your preferred proxy IP location and change your IP address at anytime. The automatic startup option will ensure your IP is protected at all times, even before your Internet connection starts. Our free Ad and Malware databases can protect your PC from infections in realtime and speed up your web browsing by blocking unwanted websites. What do you think about SafeIP? Do you recommend it? Why?